I am looking forward to working with you on engage universe, and in particular in supporting you in developing your engage business. I first became aware of IoweU approaches when I was looking for ways to improve the business development skills of professionals at KPMG in China, where I was head of Market Services and Learning and Development. We had been trying to improve the mindset and ability of our partners and managers for some time, running a variety of workshops with the ‘usual suspects’ sales training organisations – Huthwaite, Richardson, and a few others. Although our efforts did change peoples’ approach slightly, we needed something with more bite…something more practical. I knew of David from his time at PwC, so we brought him in to train up our people through a fairly intensive program spread over three months. The feedback we received was terrific, and we could see tangible results within a few weeks, with stronger and deeper relationships built, and new work starting to be won. It pleases me greatly that KPMG still consider David one of their trusted partners. So when I left KPMG a few years ago, David and I spoke, and we started to look at how we could further develop the IoweU product, especially how we could help people through the use of technology and other tools, as well as creating more integrated ways to develop skills. I have concentrated recently on building the engage universe online presence, including the new website, the Affiliate Support Centre, and e-learning, where we now have 19 modules. As you can imagine, creating these has taken quite a bit of time, and we are constantly looking at ways to improve them. We are now aiming to have an integrated micro-learning program on questioning skills released in the coming months. Well, my background is as a bean-counter. After completing university in Manchester, I trained to be a Chartered Accountant in the early 1990s in northern England. After qualifying, I decided that auditing wasn’t really for me, so moved over to Hong Kong in 1994 as an accounting training manager, originally for only two years. I was lucky to work in a growing and vibrant firm, as KPMG expanded into mainland China increasing in size from under 1,500 people to over 8,000 people in just over a decade. Although initially focused on L&D, I was asked to do other things, including heading up areas such as Communications, Knowledge Management, Marketing, and helping lead the development of the global organisation’s core values. I was fortunate enough to be made a Partner in 2003, and thoroughly enjoyed my time there. I left five years ago, and since then have provided learning and development consultancy services, as well as pursuing other business interests in England, including owning a children’s day nursery, and undertaking some small scale property development in Yorkshire. I am a keen football fan, and have supported Manchester United since the early 1980s – watching them when they didn’t win too much in the years before Ferguson arrived! I still retain my Season Ticket at Old Trafford, despite living 6,000 miles away, though do manage to see a few games every year. Although they are not the team they were a decade ago, it still pleases me that they have won the Premier League more recently that David’s middle-table Arsenal. I am married to Claire, who is an English teacher. We actually came out to Hong Kong together – getting married only three days before our flight here, and with only two suitcases between us. 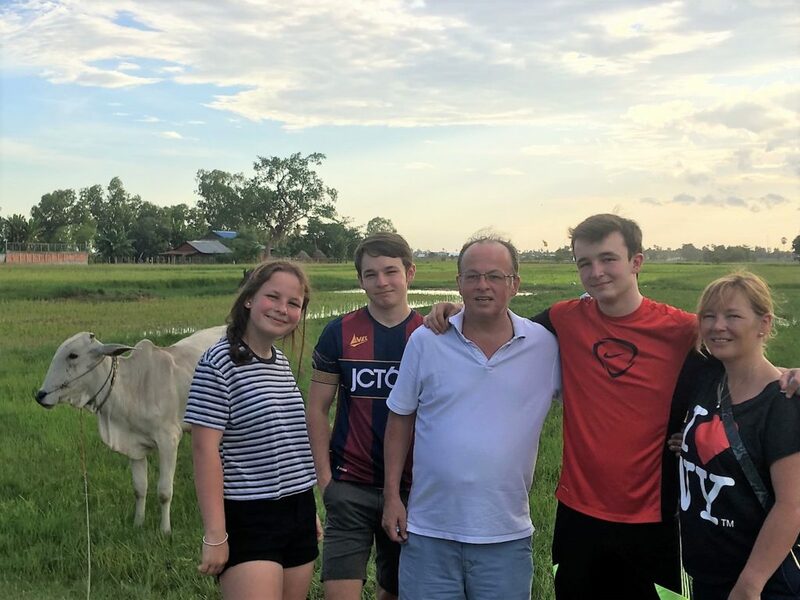 We planned to stay for two years – but have now built a life in Asia, and all our children have grown up here and love the city. I have two boys (well men now), Matthew and Rob, who are at university in England; and a teenage daughter Lizzie. I am really excited by the opportunities that engage presents for people trying to build their business relationships and sales. I feel strongly that with the robust nature of the IoweU approach, coupled with the great tools and learning we are developing, we can make a real difference – just as David did for people at my old firm. Key to seizing these opportunities is a strong network of affiliates, fully supported through ongoing two-way communication with engage universe, and I am keen to make this happen.